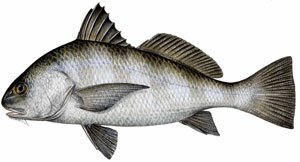 The black drum ranges from Massachusetts to Argentina occurring predominately in inshore waters and estuaries. Adults and juveniles are most often found over muddy bottoms of deeper channeled areas of bays, estuaries, and lagoons. Spawning occurs during the winter and early spring months. Black drum reach maturity by four or five years of age and may live up to sixty years. This is one of the largest species in its family (Sciaenidae) growing to over one hundred pounds.Typical of the family Sciaenidae, black drum use the sonic muscle – swim bladder mechanism to produce sounds associated with courtship and spawning. Sound production begins each evening near dusk during the spawning season and continues for several hours after nightfall. Because of their large size these fish produce very loud low frequency sounds which range from about 60 -1100 Hz, with most of the acoustic energy concentrated below 400 Hz. At these low frequencies a black drum call can travel a great distance underwater. In southwest Florida residents living along canals frequently hear black drum calls in their homes during the spawning season. This is possible because the low frequencies of these calls are able to travel through the ground and into the walls and floors of the home. Black drum also use sound as a fright response when handled. There is also evidence to suggest that females also produce sound and that sound production of black drum may have a complex social structure associated with it.